In C++11, enums can be forward-declared with a fixed underlying type, and in C we allow them to be forward-declared with no underlying type as an extension. Definition at line 3325 of file Decl.h. Definition at line 3448 of file Decl.h. Definition at line 3450 of file Decl.h. Definition at line 3584 of file Decl.h. Definition at line 3585 of file Decl.h. When created, the EnumDecl corresponds to a forward-declared enum. This method is used to mark the declaration as being defined; its enumerators have already been added (via DeclContext::addDecl). NewType is the new underlying type of the enumeration type. Definition at line 4024 of file Decl.cpp. References clang::TagDecl::completeDefinition(), clang::QualType::getTypePtr(), and clang::TagDecl::isCompleteDefinition(). Definition at line 3998 of file Decl.cpp. 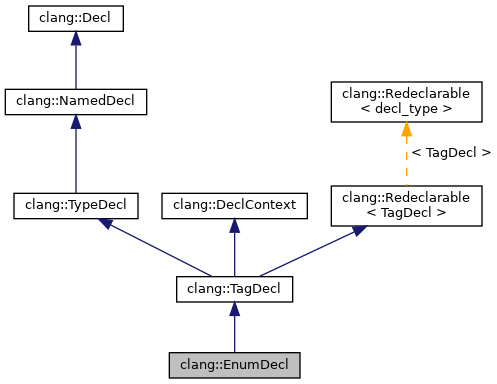 References clang::C, Enum, clang::ASTContext::getLangOpts(), and clang::ASTContext::getTypeDeclType(). Definition at line 4010 of file Decl.cpp. References clang::C, Enum, clang::ASTContext::getLangOpts(), and clang::TagDecl::setMayHaveOutOfDateDef(). Definition at line 3456 of file Decl.h. Definition at line 3463 of file Decl.h. Definition at line 3452 of file Decl.h. Referenced by hasDefaultSetterName(), clang::TemplateDeclInstantiator::InstantiateEnumDefinition(), clang::Sema::IsValueInFlagEnum(), and UseNSOptionsMacro(). Definition at line 3404 of file Decl.h. Referenced by isInstantiationOf(), and clang::ASTDeclReader::VisitEnumDecl(). Definition at line 3407 of file Decl.h. Definition at line 3426 of file Decl.h. Referenced by appendEnumType(), clang::Sema::CodeCompleteCase(), hasDefaultSetterName(), clang::ASTNodeImporter::ImportDefinition(), clang::Sema::InstantiateClassMembers(), and clang::Sema::InstantiateEnum(). Returns the enumeration (declared within the template) from which this enumeration type was instantiated, or NULL if this enumeration was not instantiated from any template. Definition at line 4084 of file Decl.cpp. Referenced by adjustDeclToTemplate(), adjustTemplateImplicitInstantiation(), getTemplateInstantiationPattern(), clang::Sema::InstantiateEnum(), isInstantiationOf(), and clang::Sema::RequireCompleteDeclContext(). This returns a null QualType for an enum forward definition with no fixed underlying type. Definition at line 3479 of file Decl.h. Referenced by clang::ODRHash::AddEnumDecl(), clang::Sema::BuildUnaryTransformType(), clang::Sema::CheckEnumRedeclaration(), clang::CodeGen::CodeGenTypes::ConvertType(), clang::CodeGen::CodeGenFunction::EmitCXXNewExpr(), getIntegerTypeForEnum(), getRangeForType(), clang::ASTContext::getTypeInfo(), hasDefaultSetterName(), isLayoutCompatible(), ObjCEncodingForEnumType(), rewriteToNSMacroDecl(), clang::ASTDeclWriter::VisitEnumDecl(), and clang::TextNodeDumper::VisitEnumDecl(). Retrieve the source range that covers the underlying type if specified. Definition at line 4018 of file Decl.cpp. Return the type source info for the underlying integer type, if no type source info exists, return 0. Definition at line 3495 of file Decl.h. Referenced by clang::ODRHash::AddEnumDecl(), AnalyzeBitFieldAssignment(), and clang::ASTDeclWriter::VisitEnumDecl(). If this enumeration is an instantiation of a member enumeration of a class template specialization, retrieves the member specialization information. Definition at line 3573 of file Decl.h. Referenced by clang::Sema::InstantiateEnum(), clang::ASTDeclWriter::VisitEnumDecl(), and clang::ASTDeclReader::VisitEnumDecl(). Definition at line 3419 of file Decl.h. Definition at line 3422 of file Decl.h. Returns the width in bits required to store all the negative enumerators of this enum. Definition at line 3516 of file Decl.h. Referenced by AnalyzeBitFieldAssignment(), clang::Sema::CheckFloatComparison(), getRangeForType(), clang::ASTNodeImporter::ImportDefinition(), and clang::ASTDeclWriter::VisitEnumDecl(). Returns the width in bits required to store all the non-negative enumerators of this enum. Definition at line 3505 of file Decl.h. Definition at line 4097 of file Decl.cpp. Referenced by clang::ASTDeclWriter::VisitEnumDecl(), and clang::ASTDeclReader::VisitEnumDecl(). Definition at line 3411 of file Decl.h. Definition at line 3415 of file Decl.h. Return the integer type that enumerators should promote to. Definition at line 3471 of file Decl.h. Referenced by clang::ASTNodeImporter::ImportDefinition(), and clang::ASTDeclWriter::VisitEnumDecl(). Retrieve the enum definition from which this enumeration could be instantiated, if it is an instantiation (rather than a non-template). Definition at line 4069 of file Decl.cpp. References getDefinitionOrSelf(), getInstantiatedFromMemberEnum(), getTemplateSpecializationKind(), and clang::isTemplateInstantiation(). If this enumeration is a member of a specialization of a templated class, determine what kind of template specialization or instantiation this is. Definition at line 4051 of file Decl.cpp. Returns true if this enum is either annotated with enum_extensibility(closed) or isn't annotated with enum_extensibility. Definition at line 4037 of file Decl.cpp. Returns true if this enum is annotated with flag_enum and isn't annotated with enum_extensibility(open). Definition at line 4043 of file Decl.cpp. Returns true if this enum is annotated with neither flag_enum nor enum_extensibility(open). Definition at line 4047 of file Decl.cpp. Returns true if this can be considered a complete type. Definition at line 3533 of file Decl.h. Referenced by getIntegerTypeForEnum(), clang::IsEnumDeclComplete(), clang::Type::isIncompleteType(), and isLayoutCompatible(). Returns true if this is an Objective-C, C++11, or Microsoft-style enumeration with a fixed underlying type. Definition at line 3528 of file Decl.h. Referenced by clang::Sema::CheckEnumRedeclaration(), clang::Sema::CheckFloatComparison(), clang::CodeGen::CodeGenTypes::ConvertType(), getRangeForType(), ObjCEncodingForEnumType(), clang::Sema::PerformImplicitConversion(), clang::ASTDeclWriter::VisitEnumDecl(), and clang::TextNodeDumper::VisitEnumDecl(). Definition at line 3519 of file Decl.h. Referenced by clang::ODRHash::AddEnumDecl(), clang::Sema::CheckEnumRedeclaration(), getIntegerTypeForEnum(), hasDefaultSetterName(), clang::TemplateDeclInstantiator::InstantiateEnumDefinition(), clang::IsEnumDeclScoped(), clang::ASTDeclWriter::VisitEnumDecl(), and clang::TextNodeDumper::VisitEnumDecl(). Definition at line 3522 of file Decl.h. Referenced by clang::ODRHash::AddEnumDecl(), clang::ASTDeclWriter::VisitEnumDecl(), and clang::TextNodeDumper::VisitEnumDecl(). Specify that this enumeration is an instantiation of the member enumeration ED. Definition at line 3579 of file Decl.h. Set the underlying integer type. Definition at line 3488 of file Decl.h. Referenced by clang::Sema::DeclareGlobalNewDelete(), and clang::ASTDeclReader::VisitEnumDecl(). Set the underlying integer type source info. Definition at line 3491 of file Decl.h. Definition at line 3474 of file Decl.h. For an enumeration member that was instantiated from a member enumeration of a templated class, set the template specialiation kind. Definition at line 4058 of file Decl.cpp. References clang::MemberSpecializationInfo::getPointOfInstantiation(), clang::SourceLocation::isInvalid(), clang::SourceLocation::isValid(), clang::MemberSpecializationInfo::setPointOfInstantiation(), clang::MemberSpecializationInfo::setTemplateSpecializationKind(), and clang::TSK_ExplicitSpecialization. Definition at line 3402 of file Decl.h.